At the beginning of the school year I introduced a reading program that I hoped would inspire my students to read. I was introduced to it by my sixth grade teacher, Mrs. Smith and loved it. The fun was in not just reading, but you were to “Read-Around-The-World.” For my students I created hot air balloons for each along with a passport that had to be stamped to move forward. They had a very twisting and twirling path to travel. For every two books read and reports written and approved, they moved one city. They got on the map in Mexico City, headed into South America then across to South Africa and up into Europe, the Middle East, to SE Asia, Australia, back up north finally jumping off in Tokyo to head to Portland, Oregon – their final destination (and where I am from!). 48 books they have to read over the course of 38 weeks in the school year. Well I am thrilled to say they have taken to the program and have become avid readers. Their book reports are getting better and they are so excited to turn in their passports and book reports so they can get a “stamp” – sticker and move to a new city. And one has just completed her trip around the world. 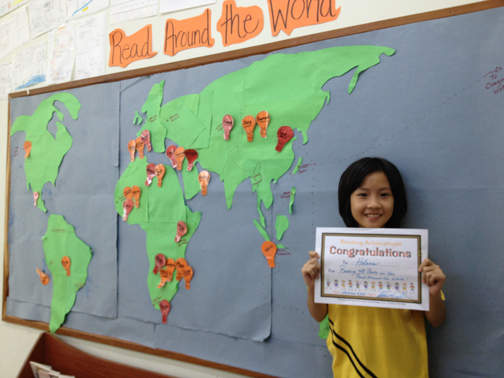 Helena, who is one of my brightest and best students, just finished her 48th book and report. She was so excited to finish first. And she is no longer reading the Magic Tree House level; she is up into the reading level of Harry Potter and the Narnia books. She loves it and continues to read with gusto, so fun to see. Personally I have enjoyed this year Geraldine Brooks’ titles “The Year of Wonders” and “Caleb’s Crossing” and I am currently involved with J.K.Rowlings first adult book “The Casual Vacancy.” Have any good book titles to share? Please do! I am so proud of you my friend! !